Cleaning your motorcycle can be like cleaning your favorite sweater: wash it the wrong way and it’ll never look the same again. Of course, the stakes are much higher when your bike’s involved since you’ve spent more money on it than you did the sweater (at least I hope so). To avoid the heartache that follows causing needless damage to your bike, take a look at some of the tips I’ve provided for the best way to wash a motorcycle, including the best motorcycle cleaner and motorcycle polish. Make sure the cleaning conditions are just so. It’s not so much that you have to worry about the weather as you do about where you choose to clean your bike. Since streaks and water spots are less than ideal, choose a spot that’s not in direct sunlight. And, if your bike’s been exposed to heat for any period of time (including any residual heat from a recent ride), make sure it’s completely cooled down before you get to work. Choose the right motorcycle cleaning products and equipment. When selecting cleaning supplies, make sure every product is designed for the task by reading the ingredients before application. You’ll quickly learn using good products not only eliminates unnecessary steps, but also makes cleaning feel less like a chore. One of the best motorcycle cleaners I’ve used is made by a company called Bike Brite. They’ve been in business for over 25 years and their products are specifically formulated for the motorcycle industry. 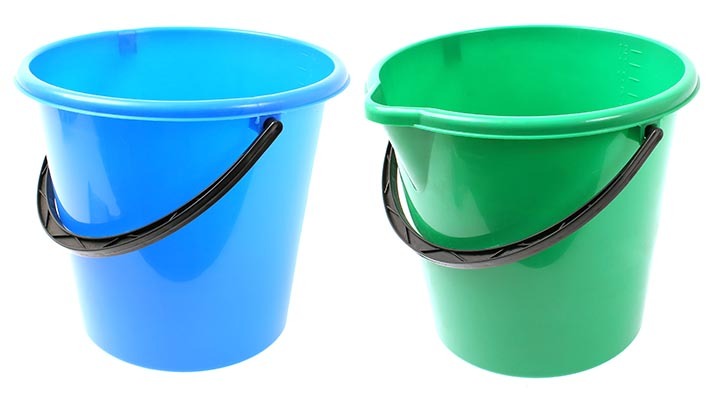 As for cleaning equipment, I’m a fan of the two-bucket method, personally, because it lessens the likelihood of debris and dirt getting onto my bike while I’m washing it (which we all know is responsible for some of the scratches we see on others’ bikes). Have a couple microfiber cloths or wash mitts handy, too (one that’ll get wet with solution while you wash, the other you’ll use to dry), as well as a polishing cloth or pad. Get your workstation ready in advance. Just like you’d get all your ingredients prepped before you begin cooking a new recipe, you’ll want to gather the necessary motorcycle cleaning products before you start cleaning—efficiency is key. Also, find a cleaning area that can withstand getting wet and soapy. If you don’t trust yourself not to get ungodly amounts of water in your pipes, it’s best to take the safe route and plug ‘em up with either a rag or a rubber plug (if you have some handy). Spray your bike with a mixture of motorcycle cleaner and water. 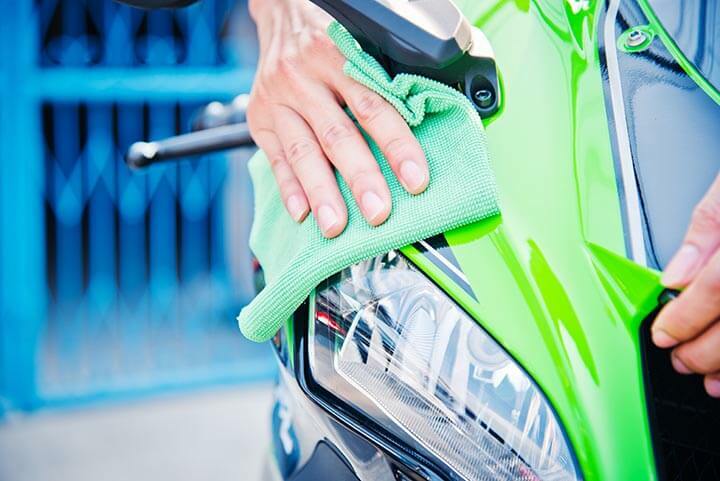 Before a gentle wipe-down or a full wash, examine the surface of your bike. There may be leftover debris hanging out from your last ride, invisible to you at first, until you scrub your bike down and scratches that weren’t there before suddenly appear. Spraying your bike with the water-cleaner combination before applying friction will loosen up dirt particles, bugs, etc. After it’s set for a bit, rinse your bike down with water. In some cases, it’s best not to use a power washer to remove debris or rinse, but I’ll leave that up to you. Wash your bike (but avoid the chain and brakes). Using as little force as possible, begin washing your bike with the desired solution by starting at the top and working your way down, taking care to check your work as you go. As always, keep an eye out for any unwanted debris. And avoid scrubbing down the chain and brakes—removing the coating on either of these could be bad news down the road. Rinse and dry your motorcycle immediately after washing. Streaks will show up on your bike just like they will your car, so rinse immediately. As for drying, a microfiber cloth or natural chamois are tried-and-true, but if you have an air blower lying around, this will help eliminate the possibility of any of your bike’s beloved parts corroding from leftover water. Plus, you won’t have to constantly remind yourself to pat the bike dry. When you’re done with the chrome and aluminum, move on to polishing the paint and your wheels. Apply polish and wax in straight lines, allowing time for a haze to form before you wipe with a clean microfiber cloth (yes, it must be clean, otherwise you’ll erase all the work you’ve done). Eager for more tips on how to wash a motorcycle? Read Sell My Motorcycle: How to Wash Your Ride.